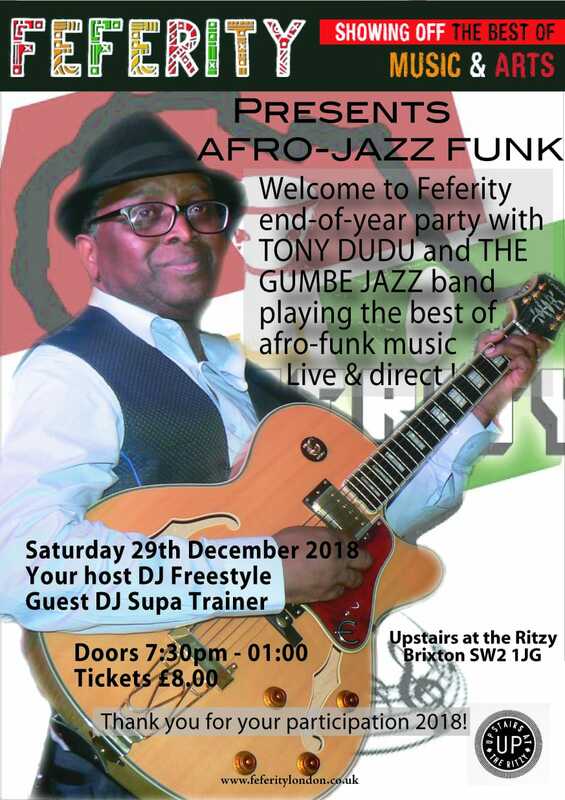 The Guinea Bissau Jazz guitar legendary Tony Dudu and The Gambe Jazz by popular demand is here again to grace this year 2018 Feferity end-of-year party. That doesn’t end there, you gonna be party to some Afrobeats, South African house/dance tunes + Rnb old skool, funk & soul music! Tony Dudu is such an incredible musician with musical skills that forces you to act instinctively. At the age of twelve he joined “Os Lacaraes”, Guinea-Bissau’s first infants musical band. Two years later he was invited to play with the famous group “Africa Livre”, where he met Manecas Costa and “Justino Delgado”, and later became their lead guitarist respectively. It was during this time that Tony began to receive recognition for his virtuosic and melodic guitar playing. He was also a lead guitarist for Valdemar Bastos, Eneida Marta, Tabanka Djazz, Don Kikas, Bonga, Juca and many more. His last album “Bin no Bai” was launched in Portugal two years ago. Now he’s working on his new album coming out in the summer of 2019. If you love music and wants it to excite you, well this is your chance to be part of a memorable end of year party. Come witness Tony Dudu and the Gumbe jazz band on stage performing some of their beautiful rhythm styles of Afro-jazz, soul & disco fusion. All in the name of festive spirit. With your host DJ Freestyle throwing down some classic Fela Kuti and comrades of the 70s and 80s AFROBEAT era, plus some classic reggae like from Toots and the Maytals, Beres Harmond to Chronixx. Come and be part of a memorable end Feferity 2018!! !